(Updated May 2018) Dollar General is known for its affordable prices, product variety, and great customer service. To make sure that each location is meeting their requirements, Dollar General invites customers to fill out a feedback form at www.dgcustomerfirst.com. They encourage people to complete the Dollar General customer satisfaction survey by offering people the chance to win prizes if they take the online survey. In this article, we will show you just how easy it is to take the survey and register for a prize. To take the Dollar General survey, you will need to keep your Dollar General receipt. When the DGCustomerFirst survey takes feedback, Dollar General receipts will feature a survey code. This code will allow you to access the questionnaire at www.dgcustomerfirst.com. Note that there are times when Dollar General is not collecting feedback, and thus your receipt will not feature a survey invitaton ID. In addition, survey participants must be at least 18 years old. If you are a Dollar General employee you will not be able to take the Dollar General survey. Likewise, household and family members of Dollar General employees are not elligible to take the survey. Anyone who meets the above requirements and takes the Dollar General customer survey is eligible for two sweepstakes entries. People who win either sweepstakes program are awarded money that they can use for whatever they want. Each week, Dollar General will conduct a drawing from a pool of all people who took the survey that week. One winner will be selected to receive a check for $100. There are also monthly drawings that the DGCustomerFirst survey takers are also entered into. If you win a monthly drawing, you get a check for $500. Open www.dgcustomerfirst.com, the official Dollar General survey website. 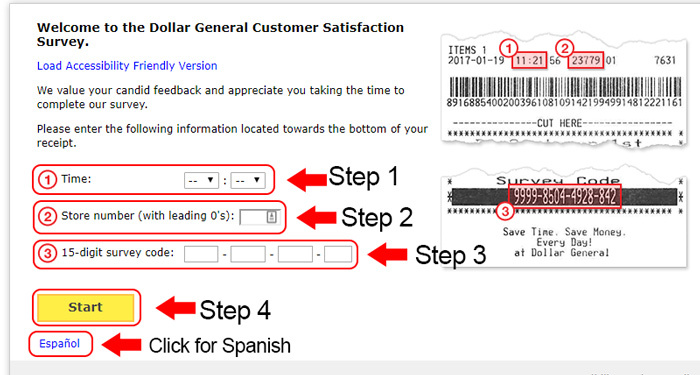 Before starting the Dollar General survey, you will have the option to switch to Spanish. Use the drop down menu to select the time of your visit. Enter the Dollar General store number to identify the store you visited. Type in the 15-digit Dollar General survey invitiation code. Click the start button to begin the DGCustomerFirst survey. Rank your level of satisfaction with your visit on a scale of “Extremely Satisfied” to “Not at all Satisfied” and then click the next button. Provide more detailed feedback on your visit. Click the next button to agree to the Dollar General survey sweepstakes rules and register for the Dollar General survey sweepstakes. Fill in your contact information so you can be notified if you win. Those who would like more assistance in completing the Dollar General customer satisfaction survey can reach their customer support team through one of these methods. Please remove those donation signs . To donate to the red cross . The Red Cross does not help any hurricane or anyone else they use the money for salary . Unpaid Volunteers are out there doing the work and the Red Cross gets the credit . Shame on you if you support that. Congress questioned them about what petcent goes to victims it was less than 10% . Shame on you unless dollar tree is getting a kickback too. like your store a lot…………..
Have you taken the survey? We’re sure they would appreciate that! I love the clerk’s I am in bad health I’m on oxygen I have days I can’t hardly breathe .they know and they will say what you need I tell them they go get it .without even asking .you wdont know how that makes me feel .thank you all .